This series presents directions to stimulate the thinking of pastoral leaders, helping them focus on the important ministry of inviting. Parishes may, to a greater or lesser extent, greet and welcome. But few parishes consciously invite – and this at a time when participation in church is falling across all the religious spectrum. What Are We Inviting Them To? By Fr. Frank DeSiano, CSP. Of all the disheartening questions, designed to take the air out of any evangelization balloon, this one is the most devastating – what are we inviting them to? The assumptions behind this question are shocking because people use these words as if the whole tradition of Catholic life and worship were worthless and hopelessly unappealing. The implication is that there is nothing attractive or compelling about Catholic faith, as if were some near-dead patient with no energy or health. We hear it all the time. Mass is boring. Catholics don’t take their faith seriously. Priests are just fulfilling their job. The Church is all about preserving the institution. The Gospel isn’t preached. Ceremonies are done unceremoniously. The Church is too liberal; the Church is too conservative. Catholics are catechized but not evangelized. Catholics are not catechized. It’s all external form: obligation and fear motivate Catholics, not the love of Jesus. What does the Church have to offer people of today? Younger generations are just walking away from the Church. We hear it all the time – what are we inviting them to – the slogans we use to undermine the very faith and life we have, the language we use to bad-mouth ourselves, to demonstrate that we do not even believe in ourselves, let alone believe in inviting others to discover Jesus Christ in our Catholic tradition. How shocking is this? Of course, what makes a litany-of-failure like this so compelling is that, for sure, there is some kind of truth in almost every statement people make about the Church. Catholics are far from perfect and we wear our flaws sometimes way too overtly on our sleeves. Sometimes I come out of church after Mass shaking my head at the desultory way Catholics celebrated the liturgy, or the automatic-pilot pace of the Mass. 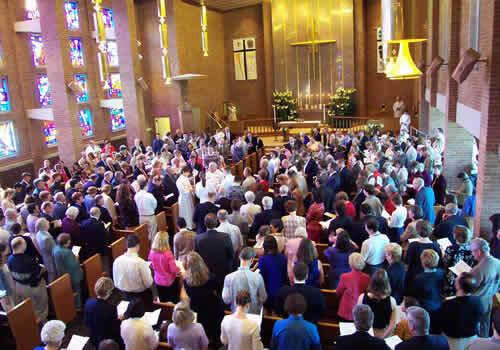 Nevertheless, no Church has what the Catholic Church has to offer: a universal communion, gathering all of humankind into a community of grace and love, celebrating sacraments that go back to the first gestures of Christianity, proclaiming a Gospel that still changes lives because it brings Jesus Christ to the World, with a moral and social vision that both deepen and grow. Sometimes I think we Catholics feel we are teenagers with too many pimples, or men too skinny to show up at the beach, or women who see themselves only as overweight. We focus so much on the blemishes that we cannot see the brilliance, the joy, the grace, and the power of the way of life we have to offer people. None of these beautiful traits come from us: rather, they come from Christ shining upon us with his Holy Spirit. Our Catholic life is a work of grace; to acknowledge that is to acknowledge God’s goodness. One frequently finds “solutions” to the Catholic “problem” that seems like radical lobotomies-wholly different ways of doing parish, or wholly different ways of conceiving of Catholic life, as if the fundamental task were not to unpack what the Spirit does to us on a regular basis. We do not have to re-invent God’s gifts; we need to live them more fully and freely. The whole Catholic evangelization movement, engendered by Pope Paul VI at its best, states that none of us are completely evangelized, that Catholic life is a constant growth in faith: the Church “seeks to deepen, consolidate, nourish and make every more mature the faith of those who are already called the faithful, or believers, in order that they may be so still more. (On Evangelization in the Modern World, #54)” So something is always lacking in Catholic and Christian life. But these defects do not eliminate what the Church has to offer – and what every human being is invited to receive – the life of Christ Jesus given to communities of disciples to advance the Kingdom of God and continue the transformation of humankind. We Catholics have no need to apologize for what we are inviting people to: Christ, the Spirit, relationship with God, reception of God’s Word, participation in God’s life through sacred signs and sacraments, a moral vision grounded in God’s love, a social vision elaborated in the hope of God’s Kingdom, and a world-wide community of grace. Ideally these qualities would shine forth in every parish; actually, they can only be partially realized in any parish because they are such high ideals. But the Catholic project is broad and bold: not to develop a congregation of fervent people here or there, even if they have memberships of thousands; that’s the Protestant megachurch model. Rather, Catholicism wants to instill the ideals of Christian life broadly and deeply across over a billion people, in thousands of dioceses, and in tens of thousands of parish communities. Catholics aim high. Perhaps, for this reason, they seem to fail more. But aiming lower is not an option. Of course, parish communities need to embody this visionary ideal with some basics which have become clearer to us since the Second Vatican Council: good worship, good preaching, good religious formation (adults and children), and good service of others (parishioners and, even more, those in need), and strong invitation. It is hard to invite people to religious communities where the worship, preaching, religious formation, and care of others is impoverished. Attending to these basics is the primary obligation of pastors. But if we are trying to embody these ideals, and striving to provide these basics, then a parish has no reason to hang its head low. It has plenty to invite others to. It has nothing less than the Gospel, and a modern-Gospel-way-of-life, to offer. Indeed, the indictment of modern Catholicism in Europe and America is not that it has totally failed. Rather, the indictment reads like this: the Spirit has given us so much, and we kept it mostly to ourselves and didn’t think to share it, through invitation, as we should. Poverty can be financial, of course; but it can be primarily cultural, relational and religious. As popes call us to serve the needy, those without a community of faith certainly fall into this category.